Ahhhh... Lemongrass! What a lovely scent! The herb is very popular for its essential oil and is often found in perfumes. This is an ingredient that can add a lemony scent to a dish, which often makes one's mouth water. Pandan is another famous ingredient used in many Malaysian cakes and dishes to raise the flavour. A combination of Lemongrass and Pandan in a cupcake is indeed a divine combination! 1) Trim the lemongrass to about 10cm in length from the root. Get rid of the leaves, root and hard parts. 2) Cut the lemongrass into small pieces using the scissors (as small as possible). 3) Blend the lemongrass together with water to be as fine as possible using a blender. 4) Get rid of the excess water content and scrap all the ground lemongrass into a bowl. It is now ready for use. Remember not to press out all the water from the ground lemongrass. NOTE: Now proceed to ingredient measurements, mixing, moulding and baking of the cupcakes. 1) Roughly cut the butter into smaller pieces and beat it together with the castor sugar until it is light and fluffy in texture. The colour should change to pale yellow. If you are using a stand mixer, use the paddle attachment for the creaming. Start from a low speed and end it with a high speed. If however you are using a hand mixer, use the beaters. Again, start from a low speed and end with a high speed. 3) Sieve together the superfine flour, bicarbonate of soda and baking powder, and add them into the mixture. Continue mixing with low or medium speed. Once the dry ingredients are well mixed, the mixture should be smooth by now. 4) It is now time to add the ground lemongrass and toasted rolled oats into the mixture and mix thoroughly. The batter is then ready to be baked! TIPS:You can actually adjust the amount of ground lemongrass according to your preference. Add in a little of ground lemongrass and taste the batter. Continue adding some until you acquire your desired taste. Adding too much lemongrass than as stated in the above is however not encouraged as this will affect the texture of the cupcakes. NOTE: Pre-heat the oven to 180°C. 1) Place the cupcake cases into the cupcake tray. 2) Using a spoon, scoop the cupcake batter into the cupcake cases. Fill it up to around ¾ full of the cases. Roughly even up the surface using a palette knife. Do not worry if the surface is not even and smooth enough as the texture will even by itself during the baking process. 3) Bake the cupcake batter at 180°C for 25 to 30 minutes. 4) To test if the cupcakes are cooked, simply insert a small knife or cake tester into a cupcake. If the knife or cake tester comes out clean, the cupcakes are cooked. Otherwise, continue baking them until the cupcakes are ready. NOTE: Once the batter is in the oven, you may proceed to ingredient measurements and making of the soaking syrup and pandan juice. 1) Put the sugar, water and smashed lemongrass stalk into a small pot. 2) Bring the mixture to a boil and turn the heat off. 3) Cover the pot with a lid or cling film to allow the infusion of the lemongrass into the syrup. 1) Cut the pandan leaves into small pieces. 2) Blend them together with the water using the blender until it becomes very fine. 3) Let it stand to infuse for about 10 minutes. 4) Pass the mixture through a muslin cloth and squeeze the pandan juice out. 5) Re-measure the pandan juice. Top up with water to make it 200g and pour the solution into a medium pot. It is now ready for use. NOTE: By this time, check if the cupcakes are ready. If they are, take them out from the oven and place them straight onto a cooking rack. 1) While the cupcakes are still warm, soak them with the lemongrass soaking syrup by brushing the syrup on the cupcakes 2 to 3 times with a pastry brush to make the cupcakes moist. 2) Then allow the cupcakes to cool down at room temperature. NOTE: It’s time to concentrate on the nice and tempting pandan frosting. 1) Into a medium mixing bowl, blanch (continuous whisking) the egg yolks (or substitute powder) together with sugar until it is pale yellow in colour with the sugar completely dissolved in the mixture. Do not leave the sugar on the egg yolks without immediate whisking as this will “burn” the egg yolks. 2) Sieve the cornflour and superfine flour onto the blanched egg yolks. Thoroughly whisk and mix the flours into the mixture. 3) Bring the pandan juice (which is in the pot) to boil. Once it starts to boil, immediately switch the heat off. Pour about 1/3 of the juice into the egg yolk mixture and stir the combined mixtures using the same whisk until completely incorporated. 4) Pour and scrape the mixture in the medium mixing bowl back into the pot containing the rest 2/3 of pandan juice and stir the mixture to thoroughly combine the ingredients. 5) Put the pot on low heat and cook the mixture while whisking it continuously. While the mixture is cooking, whisk it continuously and vigorously to avoid any burning at the bottom part of the pot, which will affect the taste of the frosting. Thick, sticky and shiny appearances with huge boiling bubbles indicate that the pandan cream is already thoroughly cooked. 6) Turn off the heat and transfer the pandan cream onto a plate. Cover with cling film and cool it down in the fridge. Make sure the cling film touches the whole top surface of the cream to prevent any skin formation on the cream during the cooling process. 7) Cut the butter into smaller pieces and put them into the mixer’s bowl or large mixing bowl. Sieve and put in all the icing sugar. Then start the mixing process with the mixer. Begin with a low speed and end with a high speed. Continue until the mixture becomes light and fluffy. 8) Once the pandan cream is cooled, take it out from the fridge and pour it into another large mixing bowl. With a whisk, vigorously whisk the cream to loosen and smoothen it. 9) With the plastic scraper, scrape about 1/3 of the butter mixture and incorporate into the loosened and smoothed pandan cream. When the first 1/3 is fully incorporated, continue with the next 1/3 and finally last 1/3 of the butter mixture. The pandan frosting should hold its shape by itself. The pandan frosting is now ready to be used. Reminder: Do NOT incorporate the butter mixture into a warm pandan cream as this will melt the butter mixture. This will end up with a curdled frosting. 1) By now the cupcakes should have been cooled down. If they are not, put them into the fridge for a few minutes. 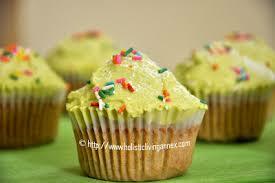 2) Scrape some pandan frosting on top of the cupcakes. Using a palette knife, smooth the pandan frosting to make them look nice, as shown in the photograph above. Alternatively, you can also put the pandan frosting in a piping bag with nozzles up to your choice and pipe onto the cupcakes. 3) Next, dust some icing sugar on the frosting. 4) Last but not least, randomly sprinkle some multi-coloured sprinkles on top for a final touch up. 5) Lovely! The cupcakes are now complete. NOTE: The decorations in the above are just a guideline. You can use your own creative ideas. This is the fun part in a baking process, isn't it? 1) Keep the cupcakes in airtight containers and put them in the fridge. They can definitely be stored up to a week. However, if you are keeping the cupcakes in cake boxes which are not air tight, it is advisable to consume them within 4 to 5 days. 2) To serve the cupcakes, take them out from the fridge and let them stand at room temperature for about 5 minutes before serving. I always do this when I serve cakes to my friends and families as I find that one can really enjoy the final product at its very best this way. And of course, enjoy it with a cup of tea. I have planted some lemon grass in my garden.. This recipe come at the right time.. Thanks for sharing.